(2016) "That's What I Like"
"24K Magic" is a song by American singer-songwriter Bruno Mars from his third studio album of the same name (2016). Atlantic Records released it as the album's lead single on October 7, 2016, for digital download and streaming. Atlantic provided it as an instant grat track for those who pre-ordered the album. Mars, Philip Lawrence and Christopher Brody Brown wrote the single. Calling themselves Shampoo Press & Curl the three of them handled production, with additional production by The Stereotypes. "24K Magic" has been described as a funk, disco and contemporary R&B song, heavily influenced by hip-hop. The A.V. Club noticed the synthesizer riff and backbeat resembled the one in "The Message" (1982) by Grandmaster Flash and the Furious Five. The song's lyrics address extravagances, glamour, and the party lifestyle. "24K Magic" was well received by most critics. Some of them complimented Mars' vocals comparing them to James Brown, describing the song as engaging, fun and evoking feeling of nostalgia. Others criticized it for not being innovative as it tried to emulate "Uptown Funk" (2014). "24K Magic" was a commercial success. It peaked at number four in the United States and number three in Canada and Australia. It has been certified five times platinum by the Recording Industry Association of America (RIAA), four times platinum by Music Canada (MC) and by the Australian Recording Industry Association (ARIA). The single reached number one in New Zealand, France, Belgium (Flanders), Argentina and Israel. It has received a diamond certification in France and a platinum one in New Zealand. In the United Kingdom and Spain, the song peaked at number five, being certified platinum by the British Phonographic Industry (BPI) and two times platinum by Productores de Música de España (PROMUSICAE). Director Cameron Duddy and Mars shot the song's music video. It depicts Mars and his bandmates partying and having fun in a Las Vegas casino. At the end of the video, Mars is riding a jet ski in the Fountains of the Bellagio Hotel. The singer performed "24K Magic" on television shows such as Saturday Night Live, The Late Late Show and it was first included on his 24K Magic World Tour (2017–18). The song received several nominations and won Record of the Year at the 60th Annual Grammy Awards in 2018. The television show soundtracks of Chicago Med (2015), and Empire (2015), and a commercial for Hershey’s Gold bar used the song. Kendrick Lamar's single "Loyalty" (2017) featuring Rihanna sampled the song's introduction. In September 2014, Mars tweeted "Now it's time to start writing chapter 3", hinting he was working on new music. Following the release of the successful Mark Ronson and Mars' single "Uptown Funk" (2014), the singer headed to the studio to record more songs. Mars said he had no plans to release a new album "[u]ntil it's done". It was due in March, but his appearance at the Super Bowl halftime show postponed it for several months. At the time seven songs were already recorded. On October 3, 2016, Mars revealed the song title and release date through his Instagram account after he uploaded nine photos. They showed the singer looking down wearing a white hat with "XXIV k" inscribed on it. Mars wrote, "You can call it my first single, but I call it the invitation to the party." The Stereotypes had known Mars and worked with him since 2007, however, after the singer signed a deal with Atlantic Records they did not collaborate very often. Nevertheless, in 2015 Jonathan Yip talked with Mars about working together. Since the singer was already recording 24K Magic, Mars asked for "some beats" and Yip sent them. Later, he asked for more beats and The Stereotypes sent them, but they never heard from him, "nothing came of it". In June 2016, Yip touched base with Mars. He asked Yip if they would like to help him finish a song for his album, to add a little "seasoning". He needed another song with a certain tempo and key. Yip sent Mars an idea that caught his attention, and he asked The Stereotypes to come to the studio. Once in the studio, it took them some time to "get the groove" on the track. They spent the first couple of hours catching up and having fun. When they began working, Ray Charles McCullough II was "getting scared". He felt this was a "make-or-break moment"—they needed to help Mars with the song. Ray Romulus recalls the artist telling them he wanted to create something that would make people dance again, because in clubs the crowd is on their phones, not moving and glancing at each other. At this point, Mars showed them a "rough idea" of the song. The Stereotypes started programming the drums for "24K Magic" and finished it in a day. It was the first track the team recorded for the album. In an interview with NME, Mars said he wrote "24K Magic" when "Uptown Funk" (2014) was "number one", so the songs share the same "spirit". In another interview with Zane Lowe for Beats 1, Mars explained that the album was going to be a movie and the lead single was its opening. He wanted the song "to get the party started". To achieve that it needed to sound genuine, and that he was having a good time, so he used his emotions and feelings to guide him. He also admitted that "24K Magic' was influenced by West Coast hip hop artists like "Dr. Dre, DJ Quik, Suga Free ... [they represented] a time when it was okay to party, to be flashy, to get on the dance floor." In November 2017, Mars was a guest on the Charlie Rose Show sharing that the song was the vision he had intended for this album "I saw us having fun on stage. I saw us draped in silk and gold and me and my friends going up on stage and having the best time. It was important that we had the content to do so." Bruno Mars, Philip Lawrence and Christopher Brody Brown wrote "24K Magic". They handled the production under the name Shampoo Press & Curl with additional production by The Stereotypes. Mars, Lawrence, Brown and James Fauntleroy provided the background vocals. Dave Foreman played the guitar, while Byron "Mr. Talkbox" Chambers and Mars provided the vocals on the talk box. Charles Moniz, with engineering assistant Jacob Dennis, engineered and recorded the song at Glenwood Place Studios in Burbank. Serban Ghenea and John Hanes, who served as the mix engineer, mixed "24K Magic" at MixStar Studios in Virginia Beach. It was mastered by Tom Coyne at Sterling Sound, NYC. "24K Magic" premiered on October 7, 2016, at midnight on radio station WBMX. Atlantic Records released the single on the same day for digital download and streaming. The album was made available for pre-order worldwide via Mars' official site, with the song as an instant download. The label also released the track to be added to Italian contemporary hit radio on the same date. Subsequently, the song was released to UK and US contemporary hit radio stations on October 8, 2016, and October 11, 2016, respectively. On May 26, 2017, Atlantic Records made a remix version by Dutch DJ R3hab available for digital download and streaming. A 20-second sample of "24K Magic" chorus' about jewelry and the party lifestyle over a funk-disco beat. "24k Magic" is a funk, disco and R&B song, heavily influenced by hip-hop. It is composed in the key of F minor at a tempo of 94 beats per minute. Mars' vocal range spans from the low note of F4 to the high note of E♭6. The song begins with a talk box intro, performed by Byron "Mr. Talk Box" Chambers and Mars. Initially, reviewers thought the vocals on the intro had Auto-Tune, a vocoder or synthetic vocals. Eventually, they concluded it was a talk box, developed by Roger Troutman and Zapp, which heavily influenced the single. Forbes and Entertainment Weekly's music critics noticed the resemblance between the "robotic-sound" intro on "24K Magic" and Tupac Shakur's "California Love" (1995). The song features several layers of funk synthesizers in its instrumentation, which drew comparisons to Prince. It also features bass lines similar to The Gap Band's style. Its structure borrows from "Uptown Funk" (2014) as Mars raps while singing the track with a "call and response" composition. The bridge features a record scratching, while the backing vocals make heavy use of a vocoder. The synthesizer riff and backbeat of "24K Magic" resembles the one in "The Message" (1982) by Grandmaster Flash and the Furious Five. Critics found the sound to be closer to the 1980s electronica, hip-hop and R&B, than the 1970s style of "Uptown Funk" (2014). The track reaches its "ebullient" and "infectious" chorus where Mars sings, "Put your pinky rings up to the moon, What ya’ll tryna do? 24K magic in the air." All the verses are designed with a call-and-response hook. In the opening lyrics, Mars shouts, "Guess who’s back again!/Oh, they don’t know? I bet they know soon as we walk in", punctuating the verses, he continues with more confidence "I’m a dangerous man with some money in my pocket", while backed up by a chorus "adding tough-guy punch to his mellifluous" shouts. The exhortations and confidence in his vocals reminded critics of James Brown. The lyrics celebrate extravagances, glamour and the party lifestyle. Many reviewers felt "24K Magic" condensed a playlist’s worth 80's electro-R&B into one song, with a modern twist on its lyrics. "24K Magic" has received positive reviews from most music critics. Entertainment Weekly's Eric Renner Brown gave "24K Magic" an "A" note. He praised the lead single saying it is on the same level as Mars' earlier, "Just the Way You Are" (2010) and "Locked Out of Heaven" (2012), and maybe even better due to its "detail and finesse". According to Brown these qualities, along with "world-class vocals", allow "24K Magic" to "levitate". He felt Tupac Shakur's "California Love" (1995) and Michael Jackson's Off the Wall (1979) influenced it. Jay Willis of GQ called the song "delightful"— the second part of "Uptown Funk" (2014). Willis praised Mars for using the same formula as the earlier single and described the intro as "reminiscent of mid-1990s K-Ci & Jojo". Carl Williott of Idolator gave the recording a 9 out 10, comparing it to "Pure Funk compilations, West Coast G-funk and to Midnight Star". Williott said the track did not bring anything new, but it came at a time there are not enough party songs. In the same review, Mike Wass awarded the song 8 out of 10 feeling that it is a mash-up of the 70's, 80's and 90's R&B into "a nuclear-power party anthem" to be played in discos over the next years. Time's Tekendra Parmar called the title track "delicious". Rap-Up thought Mars created a great song, calling the hook "infectious". Jason Lipshutz of Billboard compared "24K Magic" to the TV show Stranger Things (2016) since both evoke nostalgic feelings. He found the single "impressive", with a "killer groove" that mashed the "G-funk" genre into a song with modern elements. He also complemented Mars' vocals and "ear for melody". Patrick Bowen, reviewing the album for Idolator, said "24K Magic" has the best chorus Mars ever wrote, being superior to "Uptown Funk" (2014) in every detail. In a mixed review for Idolator, Rachel Sonis "24K Magic" a 6.5 out of 10. She described the track as "glossy, lavish and teeming with old-school The Neptunes vibes", but concluded that the single does not accomplish anything new. Robbie Daw rated the track 5 out of 10 saying that it is a throwback to the 80's R&B as a continuation of "Uptown Funk" (2014). He too thought it did not add anything new to pop music—"it simply keeps the party going." The song made the cut on several lists of best songs of the year. Entertainment Weekly's Ray Rahman dubbed the song a "bulletproof party jam", ranking it number 35 on the list of 100 songs. On the list of the 101 best songs of 2016 compiled by Spin, Winston Cook-Wilson ranked the song at number 61 saying that Mars emulated the style he listened to while growing up and was nothing but impressive. On the Billboard 100 Best Pop Songs of 2016: Critics' Picks list, the single was placed at number 64. Taylor Weatherby wrote that Mars was able to "create another bonafide [sic] hip-shaker" like "Uptown Funk" (2014) thanks to "24K Magic"'s "infectious beat and James Brown-worthy vocal exhortations". In 2016, "24K Magic" received a nomination for International Hit of the Year at the 2017 Danish GAFFA Awards. In 2017, it was nominated by the 48th NAACP Image Awards for Outstanding Song, Contemporary, but lost. At the 30th Annual Nickelodeon Kids' Choice Awards the track received a nomination for Favorite Song, and a nomination for International Hit of the Year at the MTV Millennial Awards. At the 2017 Radio Disney Music Awards, the single won the award for Best Song That Makes You Smile. "24K Magic" received the accolade for Top 10 Gold International Gold Songs at the RTHK International Pop Poll. In the same year, it was nominated for Best R&B Song at the 2017 Billboard Music Awards. The recording was nominated for Choice Music: Pop Song at the 2017 Teen Choice Awards, but lost. In 2018, "24K Magic" won Record of The Year at the 60th Annual Grammy Awards ceremony. In the same year, it lost the award for International Work of the Year at the APRA Music Awards. The song won an award for excellence in Record Production/Single or Track at the 2018 TEC Awards. Mediabase, in their year-end list of 2017, had "24K Magic" as the third most played song at Urban AC stations. In the United States, "24K Magic" debuted at number five on the Billboard Hot 100 with 101,000 downloads, 12.8 million streams and 65 million radio impressions in its first full tracking week. It was Mars' highest debut on the Hot 100 chart. On the week of December 10, 2016, the single reached its peak of number four on the Billboard Hot 100. "24K Magic" became Mars' seventh number-one song on the Billboard Rhythmic chart, and peaked at number two on the Dance Club Songs chart and Dance/Mix Show Airplay. It peaked at number three on the Billboard Adult Pop Songs and Hot R&B/Hip-Hop Songs charts. "24K Magic" peaked at number three on the Canadian Hot 100 on the week of December 31, 2016. The Recording Industry Association of America (RIAA) certified it five times platinum. Music Canada (MC) certified it four times platinum. As of September 2017, the single has sold 1,722,000 pure copies in the US. "24K Magic" debuted at number one on France's singles chart for the week ending October 15, 2016. The Syndicat National de l'Édition Phonographique (SNEP) certified it diamond. In Belgium, it reached the top spot on the Ultratop 50 in Flanders and earned a platinum certification. In its third week in Argentina, the track reached the top spot. It also peaked at number one in Israel. The song entered at number 13 on the New Zealand Singles Chart and peaked at number one spending two weeks in the top spot. It has received a platinum certification by Recorded Music New Zealand (RMNZ), with over 30,000 copies sold. In Australia, "24K Magic" debuted at number 12 on the chart, and peaked at number three. The recording has been certified four times platinum by the Australian Recording Industry Association (ARIA), with 280,000 copies sold. The single peaked at number four in Portugal after debuting at number 20. In the United Kingdom, the song debuted at number nine on the UK Singles Chart on October 20, 2016. It peaked at number five on the week of November 17, 2016. The British Phonographic Industry (BPI) certified "24K Magic" platinum for over 600,000 certified units. In Scotland, it also peaked at the top five. In the Republic of Ireland, the single peaked at number ten on the Irish Singles Chart, after debuting at number 25. The song reached the top five in Spain and later received a double platinum certification by Productores de Música de España (PROMUSICAE), and it peaked at number six in the Dutch Top 40. In Switzerland, it entered the top ten by peaking at number nine and received a gold certification by IFPI Switzerland. In Italy, the song was certified two times platinum, despite only peaking at number 16 on the chart. The recording peaked at number two on the South Korea International Chart. The song's official music video was filmed in Las Vegas, Nevada. Some of the shot locations included the Fountains of the Bellagio hotel and the Fremont Hotel and Casino. Mars and his frequent collaborator Cameron Duddy directed the video released on October 7, 2016. It begins with Mars' private jet landing at the McCarran International Airport in Las Vegas. Surrounded by luxurious cars, its steps are lowered. Then, Mars is seen wearing Versace, designer minks and a baseball cap with XXIV written on it as he starts to put on his golden jewellery; rings, necklaces chain, and sunglasses. His band, The Hooligans feature in the music video wear lightweight track suits. The rest of the video includes intercut shots of Mars and his band having fun by the poolside, partying, drinking and playing the tables at the MGM Grand Las Vegas. They party and dance, with glasses of champagne in their hands, inside and at the front of casinos. The video features several women wearing "door knocker earrings" in bikinis and sometimes wearing men’s denim, while they twerk. Other scenes include the singer and some of his bandmates driving down the Strip in a black Cadillac Allanté convertible, later purchased by Mars, and riding power-driven scooters in the casino, while "throwing money in the air". At the end of the video, Mars rides a jet ski in the famous Fountains of the Bellagio hotel. A second promotional music video with Victoria’s Secrets Angels, was released on December 2, 2016. It features Victoria Secret's models Adriana Lima, Lais Ribeiro, Taylor Hill, Elsa Hosk, Jasmine Tookes and Stella Maxwell lip-syncing to the song. It has been described as the fusion of a "homemade music video and a Victoria’s Secret ad". Raquel Rose Burger of Billboard noticed the 1990s hip-hop trends included in the music video, like tracksuits, gold chains and snapbacks, among others. Partick Bowen from Idolator found the music video "approximately 95% stunting". NME's Rhian Daly criticized the video clip not only for its lack of originality but also the number of cliches. Mars could not stop showing off how rich he is. Tom Breihan of Stereogum considered the second promotional music video average with nothing "especially fun or spontaneous about it". However, he felt "it does have a lot of very beautiful women in it". Jordan Appugliesi from Entertainment Tonight Canada thought the girls in the video looked "adorable" and they were having a blast "in the super fun video" while looking amazing. The video received multiple awards and nominations. In 2017, it received an award for Video of the Year and a nomination for Coca-Cola Viewers’ Choice at the BET Awards. At the 2017 MTV Video Music Awards, it received three nominations for Video of the Year, Best Direction and Best Art Direction. In the same year, the video received a nomination for Outstanding Music Video at the 48th NAACP Image Awards. It was also nominated for Favorite Music Video at the Nickelodeon Kids' Choice Awards. At the 2017 Soul Train Music Awards, the music video won Mars Best Dance Performance and Video of the Year. As of March 2019, the video has over 1.1 billion views on YouTube. Mars first performed the song live on Saturday Night Live on October 15, 2016. His performance was well received by critics. Daniel Kreps of Rolling Stone magazine praised the "electric performance" describing it as a "fluid, full-scale spectacle as the camera followed Mars and his singers down a hallway and into the audience" throwing an "epic dance party". Christina Lee of Idolator praised the performance, writing it was a party with a "California Love" vibe for the "Nae Nae generation." She added that Mars and his band came from backstage, "West Side Story-style, to join a crowd that was already dancing". He also performed live on The X Factor UK, on October 30, 2016. The Daily Express's Becca Longmire found the performance "epic". It caused some controversy as he and his band were accused of "miming". The singer was "extremely insulted" by the accusations and denied them. The singer performed the title track with his band on BBC Radio's 1 Live Lounge on November 4, 2016. Mars sung "24K Magic" on November 6, 2016, at the MTV Europe Music Awards. Adelle Platon of Billboard praised his show saying it was "an illuminated performance" thanks to the pyro used. He was also complemented on his "disco moves ... synched with lights on the stage floor". Later, on November 11, he performed the single on the Norwegian television talk show Skavlan and on the following day at 2016 NRJ Music Awards. Mars also performed the single at the 2016 American Music Awards on November 20. His band joined him on the stage that featured an electric blue background and pyro. The performance included a break dance. November 30, the singer performed on the Victoria's Secret Fashion Show 2016, aired on CBS. He performed during the "Bright Night Angel" segment. During The Late Late Show with James Corden on December 13, 2016, Mars included "24K Magic" on the popular segment Carpool Karaoke. "24K Magic" was the second song on the set list of his third worldwide tour—24K Magic World Tour (2017–18). Conor Maynard and Alex Aiono covered "24K Magic" in a sing-off. Kendrick Lamar's single "Loyalty" (2017) featuring Rihanna, on his album Damn (2017), sampled the song's intro. In early 2017, Heidi Klum used the track in the trailer announcement for next season of Germany's Next Top Model, where she is one of the judges. "24K Magic" ended up being used on the 12th cycle of Germany's Next Topmodel. Hershey featured the song in a commercial for its Hershey Gold chocolate bar. Several television shows have used the song. In 2016, it first appeared on the ninth episode of the second season of Rosewood (2015). The fourteenth episode of MacGyver's (2016) first season in 2017 featured "24K Magic". It made an appearance on Being Mary Jane (2013), fourth season, episode seven. The track was part of episode fifteen, season two of Supergirl (2015), as well as season two of Chicago Med (2015) on episode twenty-three. It was also included on the last episode of the third season of Empire (2015). The recording is also featured in the video game Just Dance 2018 and on the film Hotel Transylvania 3: Summer Vacation. ^ Redfearn, Dominique (October 6, 2016). "What We Know About The New Bruno Mars Album So Far". Billboard. Archived from the original on April 29, 2018. Retrieved June 9, 2018. ^ Rosen, Christopher (October 3, 2016). "Bruno Mars Is Back: New Single Coming Friday". Entertainment Weekly. Archived from the original on October 7, 2016. Retrieved October 8, 2016. ^ a b c d Kawashima, Dale (December 4, 2017). "Hit Writing/Producing Team The Stereotypes Co-Write & Produce Bruno Mars' #1 Hit "That's What I Like," And Receive 3 Grammy Nominations". Songwriter Universe. Archived from the original on July 10, 2018. Retrieved June 9, 2018. ^ a b c Russel, Bryson Kane (March 1, 2018). "The Stereotypes earned this". The Fader. Archived from the original on July 10, 2018. Retrieved June 9, 2018. ^ a b c Kennedy, Gerrick D. (January 26, 2018). "After losing steam, the Stereotypes almost hung it up — now they are up for producer of the year". Los Angeles Times. Archived from the original on January 26, 2018. Retrieved June 9, 2018. ^ a b Coscarelli, Joe (January 24, 2018). "Meet the Stereotypes, the Guys Who Help Give Bruno Mars His Bounce". New York Times. Archived from the original on June 13, 2018. Retrieved June 9, 2018. ^ a b c Wass, Mike (January 16, 2018). "The Stereotypes Talk Grammy Nominations, K-Pop & Bruno Mars: Interview". Idolator. Archived from the original on January 17, 2018. Retrieved June 9, 2018. ^ a b Weatherby, Taylor (January 26, 2018). "Producers The Stereotypes Talk Helping Bruno Mars Find the Right 'Bounce' For '24K Magic' & Earning Three Grammy Nods". Billboard. Retrieved November 3, 2018. ^ a b c MacBain, Hamish (November 18, 2016). "Bruno Mars – The Full NME Cover Interview". NME. Archived from the original on June 12, 2018. Retrieved June 11, 2018. ^ "Bruno Mars Talks "24K Magic", Beyoncé & Prince". Rap-Up. November 1, 2016. Archived from the original on November 3, 2016. Retrieved November 1, 2016. ^ Zollo, Paul (January 25, 2018). "Bruno Mars, The Stereotypes On Making '24K Magic'". The Recording Academy. Archived from the original on July 10, 2018. Retrieved June 9, 2018. ^ Armstrong, Megan (November 10, 2018). "Bruno Mars Performs 'That's What I Like' & Gets Candid With Charlie Rose: Watch". Billboard. Retrieved November 3, 2018. ^ "World Premiere of "24k Magic" on Mix.104.1". October 6, 2016. Retrieved October 8, 2016 – via Twitter. ^ a b c Zellner, Xander (October 11, 2016). "Bruno Mars' '24K Magic' & Lady Gaga's 'Million Reasons' Debut in Top 5 on Billboard + Twitter Top Tracks Chart". Billboard. Archived from the original on November 1, 2016. Retrieved October 12, 2016. ^ ""24K Magic" Bundles". Bruno Mars (official store). Archived from the original on June 9, 2018. Retrieved October 8, 2016. ^ a b "Bruno Mars – 24K Magic" (in Italian). Radio Airplay SRL. Archived from the original on October 12, 2016. Retrieved October 11, 2016. ^ a b "Top 40/M Future Releases". All Access. October 11, 2016. Archived from the original on October 5, 2016. Retrieved October 5, 2010. ^ a b "BBC - Radio 1 - Playlist". BBC Radio 1. British Broadcasting Corporation. Archived from the original on October 8, 2016. Retrieved September 24, 2016. 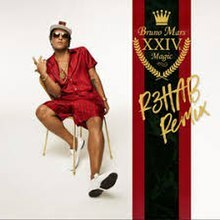 ^ a b c "24K Magic (R3hab Remix) - Single". iTunes Store. May 26, 2017. Archived from the original on July 4, 2018. Retrieved July 4, 2018. ^ a b c d Parmar, Tekendra (October 7, 2016). "Bruno Mars Just Dropped a Funky New Track '24K Magic'". Time. Archived from the original on October 7, 2016. Retrieved October 8, 2016. ^ Ryan, Patrick (November 18, 2016). "Review: Bruno Mars makes 'Magic' on throwback third album". USA Today. Retrieved June 11, 2018. ^ Daw, Robbie (October 6, 2016). "Bruno Mars Returns With "24K Magic": Watch The Video And See His Album Cover". Idolator. Archived from the original on October 9, 2016. Retrieved October 8, 2016. ^ a b c McIntyre, Hugh (October 7, 2016). "Bruno Mars Returns With Shiny New Single '24k Magic'". Forbes. Archived from the original on October 8, 2016. Retrieved October 8, 2016. ^ Lamb, Bill (November 16, 2017). "Top 10 Bruno Mars Songs". ThoughtCo. Archived from the original on July 12, 2018. Retrieved June 11, 2018. ^ a b c d e f Wickman, Forrest (October 7, 2016). "Bruno Mars' New Single Is Basically "Uptown Funk II," Will Play at Weddings for Years to Come". Slate. Archived from the original on June 5, 2018. Retrieved June 11, 2018. ^ "Bruno Mars – 24K Magic Sheet Music in F Minor". Musicnotes. Retrieved November 10, 2018. ^ a b c d Staff, Billboard (October 6, 2016). "Bruno Mars Unveils "24K Magic" Song & Video". Billboard. Archived from the original on October 7, 2016. Retrieved October 7, 2016. ^ a b c d Lipshutz, Jason (October 7, 2016). "Why Bruno Mars' '24K Magic' Is 'Stranger Things' in Single Form". Billboard. Archived from the original on June 13, 2018. Retrieved June 11, 2018. ^ Unterberger, Andrew (November 19, 2016). "Bruno Mars' '24K Magic': A Track-by-Track Guide". Billboard. Archived from the original on July 2, 2018. Retrieved June 12, 2018. ^ a b c Caramanica, Jon (November 23, 2016). "Review: Bruno Mars Delivers Decades of Funk in '24K Magic'". The New York Times. Archived from the original on November 23, 2016. Retrieved June 11, 2018. ^ a b c Renner Brown, Eric (October 7, 2016). "Bruno Mars' '24K Magic': EW Review". Entertainment Weekly. Archived from the original on October 11, 2016. Retrieved October 13, 2016. ^ a b c d e f g h i "New Music: Bruno Mars – '24K Magic'". Rap-Up. October 6, 2010. Archived from the original on October 8, 2016. Retrieved October 8, 2016. ^ a b c d e Bowman, Patrick (November 21, 2016). "Bruno Mars' "24K Magic": Album Review". Idolator. Archived from the original on June 16, 2018. Retrieved June 16, 2018. ^ a b c d e Willis, Jay (October 7, 2016). "Watch the Video for Bruno Mars' New Single, "24K Magic"". GQ. Archived from the original on June 12, 2018. Retrieved June 10, 2018. ^ a b Blevins, Joe (October 24, 2016). "This Bruno Mars mashup turns "The Message" into a 24K party anthem". The A.V. Club. Archived from the original on June 12, 2018. Retrieved June 12, 2018. ^ Corner, Lewis (October 7, 2016). "Bruno Mars releases huge new hit '24K Magic' and it's 24K gold - watch the funky video here". Digital Spy. Archived from the original on October 7, 2016. Retrieved October 7, 2016. ^ a b Staff, Billboard (December 12, 2016). "Billboard's 100 Best Pop Songs of 2016: Critics' Picks". Billboard. Archived from the original on December 13, 2016. Retrieved December 12, 2016. ^ Legaspi, Althea; Reed, Ryan (October 6, 2016). "Bruno Mars Previews New Album '24K Magic' With Joyous Funk Song". Rolling Stone. Archived from the original on January 5, 2018. Retrieved June 11, 2018. ^ a b Wass, Mike (October 7, 2016). "Pop Perspective: Bruno Mars' "24K Magic" Rated & Reviewed". Idolator. Archived from the original on October 8, 2016. Retrieved October 7, 2016. ^ O'Donnell, Kevin; Greenblatt, Leah; Vain, Madisson; Feeney, Nolan; Goodman, Jessica; Renner Brown, Eric; Rahman, Ray; Biedenharn, Isabella (December 9, 2016). "The 100 best songs of 2016". Entertainment Weekly. Archived from the original on June 12, 2018. Retrieved June 11, 2018. ^ Staff, Spin (December 13, 2016). "The 101 Best Songs of 2016". Spin. Archived from the original on September 16, 2017. Retrieved June 11, 2018. ^ Rosenstand Svidt, Ole (February 24, 2017). "GAFFA-Prisen: Og de nominerede er..." Gaffa (in Danish). Archived from the original on August 31, 2017. Retrieved January 22, 2018. ^ Lewis, Hilary; Washington, Arlene (February 10, 2017). "2017 NAACP Image Award Winners: Complete List". The Hollywood Reporter. Archived from the original on February 14, 2017. Retrieved February 13, 2017. ^ Staff, THR (March 11, 2017). "Kids' Choice Awards: The Winners List". The Hollywood Reporter. Archived from the original on March 13, 2017. Retrieved March 12, 2015. ^ Times, Latin (25 April 2017). "MTV MIAW 2017 Nominations List: Maluma, J Balvin Lead Nods Of Millennial Awards". Latin Times. Newsweek Media Group. Archived from the original on 22 April 2018. Retrieved 22 April 2018. ^ Aiello, Mckenna (April 30, 2017). "Radio Disney Music Awards 2017 Winners: The Complete List". E! Online. Archived from the original on April 30, 2017. Retrieved April 30, 2017. ^ "28th International Pop Poll Awards". RTHK. May 18, 2017. Archived from the original on 23 November 2017. Retrieved November 23, 2017. ^ Staff, Billboard (May 21, 2016). "Here Is the Complete List of Winners From the 2017 Billboard Music Awards". Billboard. Archived from the original on September 20, 2017. Retrieved May 22, 2016. ^ Rubin, Rebecca; Knapp, JD (August 13, 2017). "Teen Choice Awards 2017: 'Riverdale,' Fifth Harmony Shut Out Competition". Variety. Archived from the original on August 16, 2017. Retrieved August 27, 2017. ^ Atkinson, Katie (January 28, 2018). "Grammys 2018 Winners: The Complete List". Billboard. Archived from the original on February 8, 2018. Retrieved January 29, 2018. ^ McCabe, Kathy (March 14, 2018). "Amy Shark, Paul Kelly and Jessica Mauboy hits among Song of the Year nominees". News.com.au. Archived from the original on April 21, 2018. Retrieved April 29, 2018. ^ "The 33rd annual Namm TEC Awards Winners". TEC Foundation for Excellence in Audio, Inc. Archived from the original on 30 January 2018. Retrieved 29 January 2018. ^ "Mediabase - Year End 2017" (PDF). Mediabase. 2017. Archived (PDF) from the original on December 15, 2017. Retrieved July 4, 2017. ^ Trust, Gary (October 17, 2016). "The Chainsmokers Lead Hot 100, Bruno Mars Debuts at No. 5, Ariana Grande & Nicki Minaj Hit Top 10". Billboard. Archived from the original on October 19, 2016. Retrieved October 18, 2016. ^ a b "Bruno Mars Chart History (Hot 100)". Billboard. Retrieved November 29, 2016. ^ Mendizabal, Amaya (December 9, 2016). "Bruno Mars Tops Rhythmic Songs Chart with "24K Magic"". Billboard. Archived from the original on May 9, 2018. Retrieved June 10, 2018. ^ a b "Bruno Mars Chart History (Dance Club Songs)". Billboard. Retrieved December 13, 2016. ^ a b "Bruno Mars Chart History (Dance Mix/Show Airplay)". Billboard. Retrieved November 18, 2018. ^ a b "Bruno Mars Chart History (Adult Pop Songs)". Billboard. Retrieved December 6, 2016. ^ a b "Bruno Mars Chart History (Hot R&B/Hip-Hop Songs)". Billboard. Retrieved November 29, 2016. ^ a b "Bruno Mars Chart History (Canadian Hot 100)". Billboard. Retrieved December 20, 2016. ^ a b "American single certifications – Bruno Mars – 24K Magic". Recording Industry Association of America. Retrieved February 15, 2018. If necessary, click Advanced, then click Format, then select Single, then click SEARCH. ^ a b "Canadian single certifications – Bruno Mars – 24K Magic". Music Canada. ^ "Nielsen SoundScan charts – Digital Songs – Week Ending: 09/28/2017" (PDF). Nielsen SoundScan. Archived from the original (PDF) on October 2, 2017. Retrieved October 2, 2017. ^ a b "Lescharts.com – Bruno Mars – 24K Magic" (in French). Les classement single. Retrieved October 15, 2016. ^ a b "French single certifications – Bruno Mars – 24K Magic" (in French). Syndicat National de l'Édition Phonographique. Retrieved 14 January 2017. ^ a b "Ultratop.be – Bruno Mars – 24K Magic" (in Dutch). Ultratop 50. Retrieved January 7, 2017. ^ a b "Ultratop − Goud en Platina – singles 2017". Ultratop. Hung Medien. Retrieved February 5, 2017. ^ a b "Top 20 Argentina – Del 24 al 30 de Octubre, 2016" (in Spanish). Monitor Latino. October 24, 2016. Archived from the original on January 29, 2018. Retrieved May 1, 2017. ^ a b "Bruno Mars – 24K Magic Media Forest". Israeli Airplay Chart. Media Forest. Retrieved October 23, 2016. ^ a b "Charts.nz – Bruno Mars – 24K Magic". Top 40 Singles. Retrieved December 23, 2016. ^ a b "New Zealand single certifications – Bruno Mars – 24K Magic". Recorded Music NZ. Retrieved December 30, 2016. ^ a b "Australian-charts.com – Bruno Mars – 24K Magic". ARIA Top 50 Singles. Retrieved December 24, 2016. ^ a b "ARIA Charts – Accreditations – 2017 Singles". Australian Recording Industry Association. Retrieved December 4, 2017. ^ a b "Portuguesecharts.com – Bruno Mars – 24K Magic". AFP Top 100 Singles. Retrieved December 29, 2016. ^ a b "Official Singles Chart Top 100". Official Charts Company. Retrieved November 12, 2016. ^ a b "British single certifications – Bruno Mars – 24K Magic". British Phonographic Industry. Retrieved December 23, 2016. Select singles in the Format field. Select Platinum in the Certification field. Type 24K Magic in the "Search BPI Awards" field and then press Enter. ^ a b "Official Scottish Singles Sales Chart Top 100". Official Charts Company. Retrieved November 5, 2016. ^ a b "Chart Track: Week 47, 2016". Irish Singles Chart. Retrieved November 26, 2016. ^ "Talkin' 'bout a Revolution". Irish Recorded Music Association. October 14, 2016. Archived from the original on June 12, 2018. Retrieved June 10, 2018. ^ a b "Spanishcharts.com – Bruno Mars – 24K Magic" Canciones Top 50. Retrieved October 25, 2016. ^ a b "Spanish single certifications – Bruno Mars – 24K Magic" (PDF) (in Spanish). Productores de Música de España. Select single under "Chart", enter 2017 in the field "Year". Select 38 in the field "Semana". Click on "Search Charts". ^ a b "Nederlandse Top 40 – week 50, 2016" (in Dutch). Dutch Top 40 Retrieved December 9, 2016. ^ a b "Swisscharts.com – Bruno Mars – 24K Magic". Swiss Singles Chart. Retrieved November 28, 2016. ^ a b "The Official Swiss Charts and Music Community: Awards (Bruno Mars; '24K Magic')". IFPI Switzerland. Hung Medien. Retrieved May 18, 2017. ^ a b "Italian single certifications – Bruno Mars – 24K Magic" (in Italian). Federazione Industria Musicale Italiana. Retrieved November 28, 2016. Select "2017" in the "Anno" drop-down menu. Select "24K Magic" in the "Filtra" field. Select "Singoli online" under "Sezione". ^ a b "Italiancharts.com – Bruno Mars – 24K Magic". Top Digital Download. Retrieved January 10, 2017. ^ a b "Gaon Digital Chart – Week 42, 2016" (in Korean). Gaon. Archived from the original on October 25, 2016. Retrieved October 25, 2016. ^ Sharma, Rucha (October 7, 2016). "Watch: Bruno Mars invites you to party of a lifetime with new single "24K Magic"". Daily News and Analysis. Archived from the original on October 10, 2016. Retrieved October 8, 2016. ^ a b Locations, Global Film (December 11, 2016). "Bruno Mars – 24K Magic Filming Locations". Global Film Locations. Archived from the original on June 16, 2018. Retrieved June 15, 2018. ^ a b c d e Daly, Rhian (October 7, 2016). "Bruno Mars' '24k Magic' Video Is A Treasure Trove Of Overused Music Video Tropes". NME. Archived from the original on December 28, 2017. Retrieved June 15, 2018. ^ a b c d Rose Burger, Raquel (October 14, 2016). "Six '90s Hip-Hop Trends in Bruno Mars' New Music Video, "24K Magic"". Billboard. Archived from the original on June 12, 2018. Retrieved June 16, 2018. ^ a b R. Holz, Adam. ""24K Magic" Track Review". Plugged In. Archived from the original on July 22, 2017. Retrieved June 16, 2018. ^ a b Appugliesi, Jordan (December 2, 2016). "Victoria's Secret Angels Get Down And Lip Sync To Bruno Mars' "24K Magic"". Entertainment Tonight Canada. Archived from the original on June 16, 2018. Retrieved June 16, 2018. ^ Jackson, Danielle (December 2, 2016). "Victoria's Secret Angels lip sync Bruno Mars' "24K Magic"". Entertainment Weekly. Archived from the original on December 27, 2017. Retrieved June 16, 2018. ^ a b Breihan, Tom (December 2, 2016). "Watch Bruno Mars's Latest "24K Magic" Video Starring Victoria's Secret Angels". Stereogum. Archived from the original on June 17, 2018. Retrieved June 16, 2018. ^ Staff, Billboard (June 25, 2017). "Here Is the Complete List of BET Awards 2017 Winners". Billboard. Archived from the original on June 26, 2017. Retrieved June 26, 2017. ^ Stone, Rolling (August 28, 2017). "VMAs 2017: The Complete Winners List". Rolling Stone. Archived from the original on August 28, 2017. Retrieved August 28, 2017. ^ Staff, THR (March 11, 2017). "Kids' Choice Awards: The Winners List". The Hollywood Reporter. Archived from the original on March 13, 2017. Retrieved March 12, 2017. ^ Nordyke, Kimberly (November 26, 2017). "BET Soul Train Awards: Bruno Mars Tops With 5 Wins". The Hollywood Reporter. Archived from the original on April 24, 2018. Retrieved April 23, 2018. ^ "Bruno Mars - 24K Magic [Official Video]". YouTube. Archived from the original on June 17, 2018. Retrieved June 15, 2018. ^ Staff, Billboard (October 16, 2016). "Bruno Mars Brings '24K Magic' to 'Saturday Night Live': Watch". Billboard. Archived from the original on June 14, 2018. Retrieved June 13, 2018. ^ Kreps, Daniel (October 16, 2016). "Watch Bruno Mars Throw Epic Dance Party on 'SNL'". Rolling Stone. Archived from the original on April 6, 2018. Retrieved June 13, 2018. ^ Lee, Christina (October 16, 2016). "Bruno Mars Debuts "Chunky," Performs "24K Magic" On 'SNL': Watch". Idolator. Archived from the original on January 31, 2017. Retrieved June 13, 2018. ^ Longmire, Becca (October 31, 2016). "X Factor 2016: 'Unimpressed' viewers slam Bruno Mars for 'miming' throughout performance". Daily Express. Retrieved June 13, 2018. ^ Braboy, Mark (November 4, 2016). "Bruno Mars Performs "24K Magic" and "All I Ask" On BBC's Live Lounge". Vibe. Retrieved January 19, 2019. ^ Platon, Adelle (November 6, 2016). "Watch Bruno Mars Swag It Out With '24K Magic' at the 2016 MTV EMAs". Billboard. Archived from the original on June 13, 2018. Retrieved June 13, 2018. ^ Agency, Reuters News (November 7, 2016). "MTV EMAs 2016: Justin Bieber and Lady Gaga win as Bruno Mars and Green Day shine". The Telegraph. Archived from the original on February 25, 2018. Retrieved June 13, 2018. ^ "Bruno Mars Performs "24K Magic" on "Skavlan"". Rap-Up. November 12, 2016. Archived from the original on June 29, 2017. Retrieved June 13, 2018. ^ "NRJ Music Awards 2016 : Bruno Mars, Jenifer, Kendji et Robbie Williams en live" (in French). Charts in France. October 25, 2016. Archived from the original on June 13, 2018. Retrieved June 13, 2018. ^ Platon, Adelle (November 20, 2016). "Watch Bruno Mars Deliver Electrifying Performance of '24K Magic' at the 2016 AMAs". Billboard. Archived from the original on February 7, 2018. Retrieved June 13, 2018. ^ "Here's Everything Amazing From Last Night's Victoria's Secret Fashion Show". WBZ-TV. December 6, 2016. Archived from the original on July 10, 2018. Retrieved June 13, 2018. ^ Stolworthy, Jacob (December 13, 2016). "Carpool Karaoke: Bruno Mars and James Corden get down and funky in new teaser". The Independent. Archived from the original on June 13, 2018. Retrieved June 13, 2018. ^ Guerra, Luís (April 5, 2017). "Ele é funk, ele é rock, ele é um romântico. Bruno Mars fê-la bonita em Lisboa". Blitz (in Portuguese). Archived from the original on April 8, 2017. Retrieved April 18, 2017. ^ Bacon, Lucy (February 7, 2017). "The Vamps and Conor Maynard just had a Sing-off to Ed Sheeran's Shape of You and it's Incredible". MTV News. Archived from the original on September 5, 2017. Retrieved June 13, 2018. ^ Cinnsealach, Somhairle (April 19, 2017). "Kendrick Lamar's Collab With Rihanna Began With Bruno Mars Sample". HipHopDX. Archived from the original on April 19, 2017. Retrieved April 20, 2017. ^ "Céline gewinnt GNTM-Finale". Stern (in German). May 26, 2017. Archived from the original on June 14, 2018. Retrieved June 14, 2018. ^ Hampp, Andrew (February 14, 2018). "Songs for Screens: Harry Styles, the Killers, Bruno Mars Lead Early Olympics Brand Synchs". Variety. Archived from the original on June 10, 2018. Retrieved June 13, 2018. ^ "Rosewood Soundtrack: S2, E9 - Half-Life & Havana Nights". TuneFind. December 1, 2016. Retrieved June 14, 2018. ^ "MacGyver Soundtrack: S1, E14 - Fish Scaler". TuneFind. February 3, 2017. Retrieved June 14, 2018. ^ "Being Mary Jane Soundtrack: S4, E7 - Getting Judged". TuneFind. February 28, 2017. Retrieved June 14, 2018. ^ "Supergirl Soundtrack: S2, E15 - Exodus". TuneFind. March 7, 2017. Retrieved June 14, 2018. ^ "Chicago Med Soundtrack: S2, E23 - Love Hurts". TuneFind. May 11, 2017. Retrieved June 14, 2018. ^ "Empire Soundtrack: S3, E18 - Toil and Trouble, Part 2". TuneFind. May 24, 2017. Retrieved June 14, 2018. ^ Sanchez, Miranda (June 12, 2017). "E3 2017: Just Dance 2018 Revealed". IGN. Archived from the original on June 17, 2017. Retrieved June 25, 2017. ^ Holz, Adam R. "Hotel Transylvania 3: Summer Vacation (2018)". Plugged In. Retrieved August 1, 2018. ^ "Austriancharts.at – Bruno Mars – 24K Magic" (in German). Ö3 Austria Top 40. Retrieved December 1, 2016. ^ "Ultratop.be – Bruno Mars – 24K Magic" (in French). Ultratop 50. Retrieved January 7, 2017. ^ "Hot 100 Billboard Brasil – weekly". Billboard Brasil. October 24, 2016. Archived from the original on December 14, 2016. Retrieved December 2, 2016. ^ "Bruno Mars Chart History (Canada AC)". Billboard. Retrieved January 21, 2017. ^ "Bruno Mars Chart History (Canada CHR/Top 40)". Billboard. Retrieved November 22, 2016. ^ "Bruno Mars Chart History (Canada Hot AC)". Billboard. Retrieved December 21, 2016. ^ "Top 100 Colombia Dicembre 30,2016" (in Spanish). Archived from the original on March 12, 2017. Retrieved December 30, 2016. ^ "ČNS IFPI" (in Czech). Hitparáda – Radio Top 100 Oficiální. IFPI Czech Republic. Note: Change the chart to CZ – RADIO – TOP 100 and insert 201649 into search. Retrieved December 3, 2018. ^ "ČNS IFPI" (in Czech). Hitparáda – Digital Top 100 Oficiální. IFPI Czech Republic. Note: Change the chart to CZ – SINGLES DIGITAL – TOP 100 and insert 201645 into search. Retrieved February 6, 2017. ^ "Danishcharts.com – Bruno Mars – 24K Magic". Tracklisten. Retrieved November 30, 2016. ^ "Bruno Mars: 24K Magic" (in Finnish). Musiikkituottajat – IFPI Finland. Retrieved October 16, 2016. ^ "Offiziellecharts.de – Bruno Mars – 24K Magic". GfK Entertainment Charts. Retrieved November 25, 2016. ^ "Archívum – Slágerlisták – MAHASZ" (in Hungarian). Single (track) Top 40 lista. Magyar Hanglemezkiadók Szövetsége. Retrieved January 6, 2017. ^ "Bruno Mars Chart History (Japan Hot 100)". Billboard. Retrieved October 25, 2016. ^ "The Official Lebanese Top 20 – Bruno Mars". The Official Lebanese Top 20. November 6, 2016. Archived from the original on November 29, 2016. Retrieved November 7, 2016. ^ "Dutchcharts.nl – Bruno Mars – 24K Magic" (in Dutch). Single Top 100. Retrieved November 26, 2016. ^ "Norwegiancharts.com – Bruno Mars – 24K Magic". VG-lista. Retrieved November 26, 2016. ^ "BillboardPH Hot 100". Billboard Philippines. June 12, 2017. Archived from the original on July 2, 2017. Retrieved June 12, 2017. ^ "Listy bestsellerów, wyróżnienia :: Związek Producentów Audio-Video". Polish Airplay Top 100. Retrieved December 5, 2016. ^ "ČNS IFPI" (in Slovak). Hitparáda – Radio Top 100 Oficiálna. IFPI Czech Republic. Note: insert 201648 into search. Retrieved December 6, 2016. ^ "ČNS IFPI" (in Slovak). Hitparáda – Singles Digital Top 100 Oficiálna. IFPI Czech Republic. Note: Select SINGLES DIGITAL - TOP 100 and insert 201641 into search. Retrieved October 17, 2016. ^ "Swedishcharts.com – Bruno Mars – 24K Magic". Singles Top 100. Retrieved October 15, 2016. ^ "Uruguay General" (in Spanish). Monitor Latino. Archived from the original on May 14, 2018. Retrieved May 15, 2018. ^ "Bruno Mars Chart History (Adult Contemporary)". Billboard. Retrieved January 14, 2017. ^ "Bruno Mars Chart History (Latin Pop Songs)". Billboard. Retrieved November 18, 2018. ^ "Bruno Mars Chart History (Pop Songs)". Billboard. Retrieved November 30, 2016. ^ "Bruno Mars Chart History (Rhythmic)". Billboard. Retrieved December 7, 2016. ^ "Top 100". Record Report (in Spanish). February 4, 2017. Archived from the original on February 5, 2017. ^ "ARIA Top 100 Singles 2016". Australian Recording Industry Association. Archived from the original on January 6, 2017. Retrieved January 6, 2017. ^ "Jaaroverzichten 2016". Hung Medien. Archived from the original on December 29, 2016. Retrieved December 29, 2016. ^ "As 100 Mais Tocadas nas Rádios Jovens em 2016". Billboard Brasil (in Portuguese). January 4, 2017. Archived from the original on September 7, 2017. Retrieved September 7, 2017. ^ "Top 50 Israel airplay 2016". mediaforest.bizz. Archived from the original on September 27, 2017. Retrieved January 2, 2018. ^ "End of Year Singles Chart Top 100 – 2016". Official Charts Company. Archived from the original on December 31, 2015. Retrieved December 31, 2016. ^ "Top 100 Anual Argentina". Monitor Latino. Archived from the original on December 11, 2017. Retrieved December 10, 2017. ^ "ARIA End of Year Singles 2017". Australian Recording Industry Association. Archived from the original on January 5, 2018. Retrieved January 5, 2018. ^ "Jaaroverzichten 2017". Ultratop. Archived from the original on December 22, 2017. Retrieved December 21, 2017. ^ "Rapports Annuels 2017". Ultratop. Archived from the original on December 22, 2017. Retrieved December 21, 2017. ^ "Canadian Hot 100 – Year-End 2017". Billboard. Archived from the original on December 17, 2017. Retrieved December 17, 2017. ^ "Rádiós Top 100 - hallgatottsági adatok alapján - 2017". Mahasz. Archived from the original on February 18, 2018. Retrieved February 17, 2018. ^ "Single Top 100 - eladási darabszám alapján - 2017". Mahasz. Archived from the original on January 12, 2018. Retrieved February 17, 2018. ^ "Top 50 Israel airplay 2017". mediaforest.bizz. Archived from the original on September 27, 2017. Retrieved January 2, 2018. ^ "Jaaroverzichten – Single 2017". Hung Medien. Archived from the original on December 23, 2017. Retrieved December 23, 2017. ^ "Schweizer Jahreshitparade 2017 – hitparade.ch". Hung Medien. Archived from the original on February 8, 2018. Retrieved December 31, 2017. ^ "End of Year Singles Chart Top 100 – 2017". Official Charts Company. Archived from the original on December 31, 2015. Retrieved January 10, 2018. ^ "Hot 100 Songs – Year-End 2017". Billboard. Archived from the original on December 16, 2017. Retrieved December 12, 2017. ^ "Adult Pop Songs – Year-End 2017". Billboard. Archived from the original on February 6, 2018. Retrieved December 29, 2017. ^ "Dance Club Songs – Year-End 2017". Billboard. Archived from the original on February 14, 2018. Retrieved December 29, 2017. ^ "Hot R&B/Hip-Hop Songs - Year-End 2017". Billboard. Archived from the original on February 14, 2018. Retrieved December 12, 2017. ^ "Pop Songs – Year-End 2017". Billboard. Archived from the original on March 9, 2018. Retrieved December 17, 2017. ^ "Rhythmic Songs – Year-End 2017". Billboard. Archived from the original on February 14, 2018. Retrieved December 29, 2017. ^ "Chart Anual Monitor Latino 2018 – Argentina". Monitor Latino. Retrieved December 5, 2018. ^ "Certificeringer | ifpi.dk" (in Danish). IFPI Denmark. Archived from the original on February 21, 2017. Retrieved February 20, 2017. ^ "Gold-/Platin-Datenbank (Bruno Mars; '24k Magic')" (in German). Bundesverband Musikindustrie. Retrieved May 15, 2017.